This week I had the opportunity to participate in a radio interview for Marketplace Weekend at the University of Arizona PBS station. This proved to be a very interesting opportunity, not only to see the inner bowels of a radio station, but to hear from listeners about their gifting concerns. This was insightful as many of their concerns may be shared by you. 1. Q. Do you have any tips on how to balance your finances during the holidays? A. The most important thing to know about gifting is: can you afford to do it? 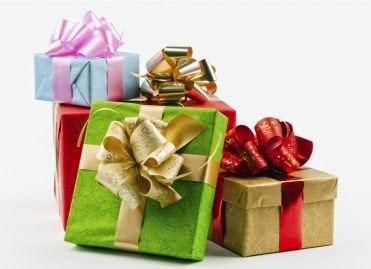 If your answer is yes, how much of your annual budget should you allocate to gifting? Considering the average family spends 60%-70% of their after tax income on the necessities of life, that leaves 30%-40% to spend at your discretion. Discretionary items include personal care, clothing, entertainment, holiday travel, gifts and charity. A realistic budget for gifts is 1%-3% of your after tax income. A similar amount can be used for charitable causes. If you have a lot of debt, or are not saving at least 10% of your income each year, it’s best to stick to the lower range. The best way to plan for gifts is to set up a Gift Savings Account in advance. This is a special bank account to which you contribute a preset monthly percentage of your income. You contribute an amount you can afford and you wish to devote to gifts. This way when the holiday season rolls around you are ready. 2. Q. Tell me about the chart you have for making Christmas presents, and other expenses during the holidays, that works for many different budgets. A. Make a list of all the people you wish to give a gift to. Divide that list into three categories: your primary relationships, your secondary relationships, and service providers. For example, gifts to your spouse and children would be your primary gifting; gifts to parents, siblings, nieces and nephews might fall to your secondary list; gifts to service providers [such as the newspaper or mail delivery person, or your children’s teachers] would make up your third list. Now take your annual gift budget (1%-3%) and allocate a dollar amount to each group; say, $75 for immediate family, $25 for extended family and $5-$15 for service providers. Clearly, the larger your family and the lower your income, the smaller each gift will be. If this is the case, you may wish to provide some groups on your list with a hand written card or some homemade cookies. One listener provided her own family’s plan, one that is used by many large families: that is to draw names from a hat on Thanksgiving and buy a gift ONLY for that person. Depending on your family, this “draw” could include everyone, only the children or only the adults. This should help you to resist temptation when you go to the shopping malls. See a sample of my chart at the end of this blog. 3. Q. When you’re short on funds but your friends, family (especially kids) still expect gifts for the holidays, how can you budget? A. Gift giving is not a competitive sport. The best gift you can give your family is financial security: the confidence that you are taking care of their long-term needs first. If you have yet to set up a Gift Savings Account and money is tight, maybe this is the year to celebrate in the old fashioned way: with homemade decorations, cards, simple gifts and time spent together. My favorite Christmas memories are the ones spent out in the cold skating with my family, especially my dad who worked very long hours and who I could never see enough of. Children will not remember the gifts they did not receive; they will always remember the good times spent together, milk and cookies left out for Santa, the dog who stole their Christmas candy, how they risked mom’s scolding by eating all of the candies and fancy tinfoil-wrapped chocolates used to decorate the tree. 4. Q. I want to go into a little bit of debt … just a little … to buy gifts that I hadn’t anticipated this year. Is that okay? A. Can you pay off ALL of your credit card debt by January? No? It would be better to set up a savings account now for next year. That way you will be ready to join in the purchase of gifts free of debt. In the meantime don’t forget that some of the best things in life are free. 5. Q. Getting creative with your gifts, or not giving gifts at all, seems like a great idea if you can’t spend a lot. Is it a great idea? A. Absolutely. There are many ways to show our love and appreciation. Gifting is just one of the five love languages identified by Dr. Gary Chapman in his books. The other four are: words of affirmation, quality time, acts of service and physical touch. Can you think of a way to “gift” the people in your life with one or more these? Quality Time – perhaps one of your loved ones is lonely or overwhelmed with caretaking of children or an elderly parent. Would they appreciate time spent with you, or time off from their day-to-day burdens? Acts of Service – One listener recalled that as a child she would provide her parents with a homemade “gift certificate” promising to take the garbage out or walk the dog on a stormy day. Physical Touch – Sometimes our loved ones simply need to be reassured of our love for them with a BIG hug. What could be simpler than that? 6. Q. Most people hide the price of the gifts they give others. (They remove the price tag, mark it out, etc.) Should people know how much you’re spending on them? Should you set limits before exchanging gifts? A. Hiding the price is a very subjective thing. If smart shopping allows you to buy throughout the year when things are on sale, why shouldn’t you use that to your advantage? Setting limits provides everyone with the opportunity to weigh in and be clear about their own budgets. Respect should be given to those who set the lowest dollar amount, as they may be struggling with other costs. 7. Q. There are many charities out there that you can give to. It’s hard to choose, and it’s hard to choose just one. How do you decide how much you can give and still feel like you’re making a difference? What a great idea! Not only do Rebecca and her family feel better about their holiday giving choices, they are now eligible for a gift of their own from Revenue Canada. Each dollar donated is eligible for a tax credit up to 75% of income. The best way to choose the charities you wish to support is to conduct an online search of the best charities. The most important thing is to donate to something you are passionate about. The second most important thing is that the charity is well run and spends most of its funds on doing good, not on supporting itself with advertising, marketing, staff salaries, etc. Taking the time to research your choices will increase your confidence in your gifting. Who receives the credit and the tax deduction for this donation? The retailer! How does supporting a retailer’s cause help you to meet your own charitable donation goals? It does not! Would it not be better to carefully consider the causes you care about and the charities you wish to support? Not only will you give in accordance with your values, your giving will be within your budget. Do not be afraid to say no. An explanation is not needed. If you feel obliged, simply tell them you have make contributions in your own name. Now that you are well prepared for the shopping frenzy, good luck out there. Wishing you and yours the best of the season.